Modern calligraphy workshops — Brahmin Lettering Co. Learn the beautiful art of modern calligraphy! 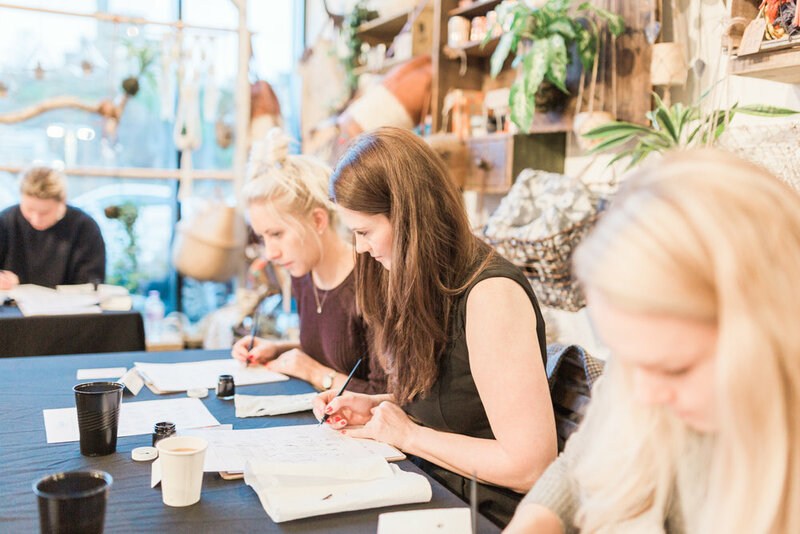 Whether you're a bride planning your wedding, looking for a new hobby or just been obsessing over all things hand lettering on Instagram, my modern calligraphy workshops will give you the skills and tools you need to start your own calligraphy practice. I currently run calligraphy workshops in Glasgow, Edinburgh and other venues throughout Scotland. If you are interested in a private workshop for a small group or hen party, contact me for more details. I can come to you or work with you to find a suitable venue. PLEASE NOTE workshop tickets are not exchangeable or refundable. Please make sure you can attend the workshop before booking. I felt so welcomed. It was like going round to a friend’s house for coffee and a calligraphy session. Don’t see a date that works for you? I'm adding new workshop dates and venues all the time! Join my mailing list and you'll receive advanced notification of ticket sales. By submitting this form you consent to Brahmin Lettering Co. contacting you as part of our email newsletter list. You can change your mind at any time by clicking the unsubscribe link in the footer of any email you receive from us, or by contacting caitlin@brahminlettering.com, which will remove you from the list. Thank you for your message. I have added you to my mailing list and you will receive advanced notice of new workshop dates. Yippee! Photography courtesy of Katy Melling.